Police say Jeffrey Mancuso killed his daughter before taking his own life. To most of her family and friends, Kayden Mancuso was a typical 7-year-old. She was a talented athlete and a good student who loved dancing and singing around the house and even competed in local pageants. "Everyone thinks their kid's the most amazing person on the planet. But this little girl was, was different. She was special," Kayden's mom Kathy Sherlock told ABC News. "Everyone wanted to be her best friend." 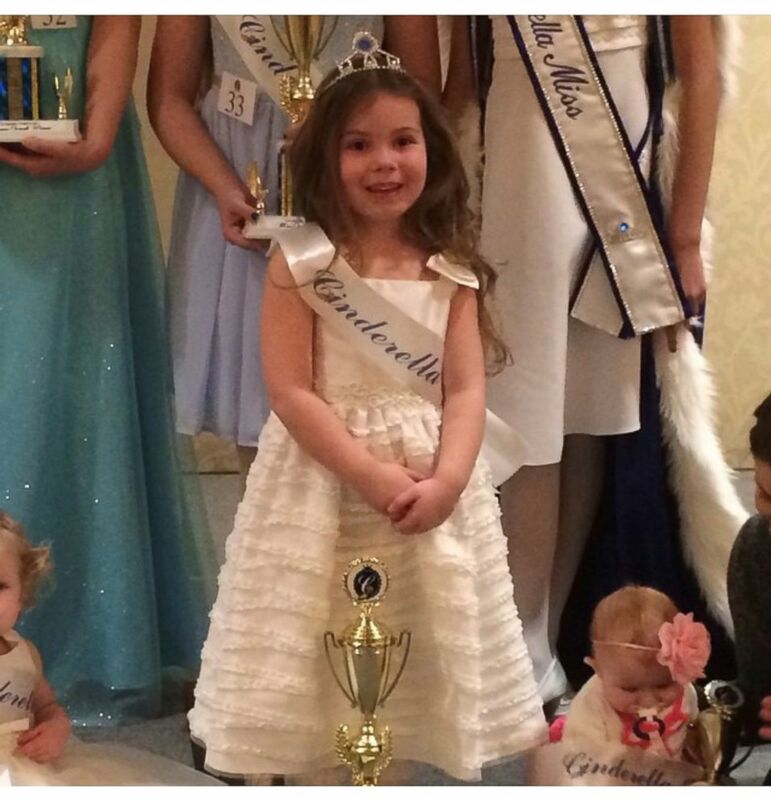 (Courtesy Kathy Sherlock) Kayden Mancuso is seen here after winning a Cinderella pageant. But on August 6, Kayden’s vibrant life was cut short in a flash. Kayden’s biological father Jeffrey Mancuso killed the young girl inside his Philadelphia home before taking his own life following a years' long, bitter custody battle with her mother. "I still don't feel like it's real," Sherlock said. "I still feel like I'm going to wake up from this awful nightmare and I just ... but I know that I'm not." 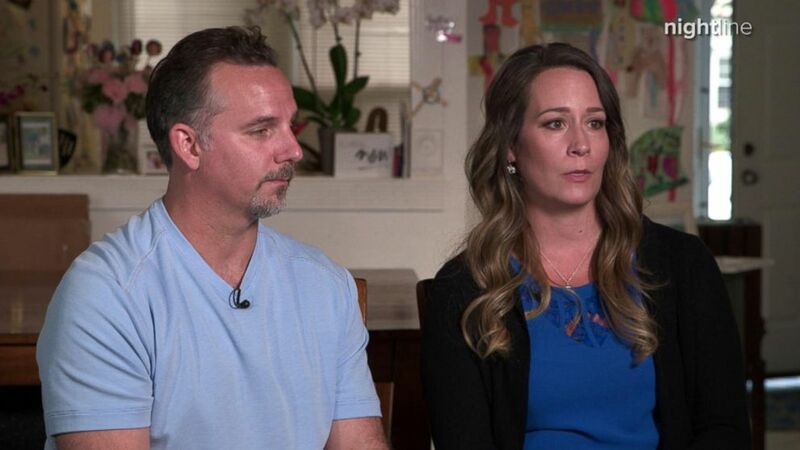 One month after their daughter's death, Kathy Sherlock and Kayden’s stepfather, Brian Sherlock, are opening up to "Nightline" in their first television interview about their unimaginable loss. They believe this tragedy could have been avoided if it weren't for the family court system that they say failed them. They hope sharing their story will shed light on mental health and family custody issues. Kathy Sherlock said she thinks her daughter's death was "absolutely" preventable. "Every single thing that could've stopped it at some point, it just didn't," she said. "A hundred percent," her husband Brian added. With Kayden, who served as the flower girl at the Sherlocks’ recent wedding, and her two younger half-brothers, Kathy and Brian thought their lives couldn’t get any better. "Everybody just adored her and loved her and just, I mean that she was a special, amazing little girl," her stepfather Brian Sherlock said. But there was someone else in the picture – Kayden’s biological father Jeffrey Mancuso. Kathy Sherlock had met him one summer on the Jersey Shore and found him "charming" at first. "He was very, he was funny. He was charming, and not charming, but he had a personality," she said. Kathy Sherlock calls their relationship a "fling." They never got married, but Kathy said they moved in together when she found out she was pregnant with Kayden. "I thought that that's what I had to do. Not to be in a relationship with him, but to try for Kayden to give her two parents," Kathy Sherlock said. "It wasn't a romantic relationship. We slept in separate rooms." Despite the chill between Kayden’s biological parents, Mancuso's sister Allyson Mancuso said their father-daughter bond was very strong. "She [Kayden] would always say how she loved him," Allyson Mancuso said. "My brother is 5'6", she would say things like, 'My daddy's so tall.' She just thought he was so tall and so strong." According to Allyson Mancuso, Kayden was one of the only bright spots in her brother’s life, which she said had been troubled since childhood, issues made worse, she said, by excessive drinking, self-medicating and violent outbursts. "He's punching teachers, getting hit in the head with a pool stick. He had 17 staples in his head, or something like that," she said. "I always said to my mom, 'Something's not right.' ... I felt he was never the same after that. It's just the emotion part was not there as it was when he was a kid." "I think that between the drinking, and the hits in the head, that he suffered from some brain damage, which caused him to progressively get mentally ill," Allyson continued. "He was okay and tolerable until Kayden." Sherlock soon discovered Jeffrey Mancuso’s violent streak, and a criminal record that included multiple assault charges across several states. She said Mancuso would call her "the worst names possible every day," and then the verbal abuse turned physical. "He had actually strangled me," she said. "I remember the only time I've ever felt like I was going to die was in the clutches of his arms ... And I just prayed," she said. "I remember being like, 'I'm going to stop breathing soon.'" Sherlock said she left Mancuso "multiple times," and went and stayed with her parents, but didn’t permanently leave for a while. "The reason that I didn't actually physically leave is because… who was going watch my child when I was at work. His mom was there," she explained. Jeffrey Mancuso’s mother not only helped to keep an eye on Kayden, but also on her son. But five years ago, Jeffery was charged with assault for biting off a man’s ear during a bar fight and for Sherlock, that was the final straw that made her leave for good. "I left, like literally packed up my house in a U-Haul on a Monday, said 'we're getting the hell out of here,'" she said. Despite fearing for her own safety by then, Sherlock never imagined Mancuso would physically harm their daughter, so she established an informal, every other weekend, custody schedule with him and he gave her money for child support. "He was loving towards her [Kayden]," Sherlock recalled. "That’s probably the only good thing he had in her… She loved him. She never talked bad about him." As Jeffrey Mancuso’s life seemed to be unraveling, Kathy moved on and fell in love with Brian Sherlock, who fell hard, not only for Kathy, but her little girl as well. (Courtesy Kathy Sherlock) Kathy and Brian Sherlock are seen here in this family photo. “It was almost love at first sight… it was definitely both of them,” Brian Sherlock said. Brian was a strong father figure for Kayden, often playing catch with her in the backyard. Whatever it was, whether it was softball, basketball, soccer or tennis, "we didn't want to end on a missed shot or a swing and miss... We wanted to end on a good one. To be positive going into the next day." Brian said. 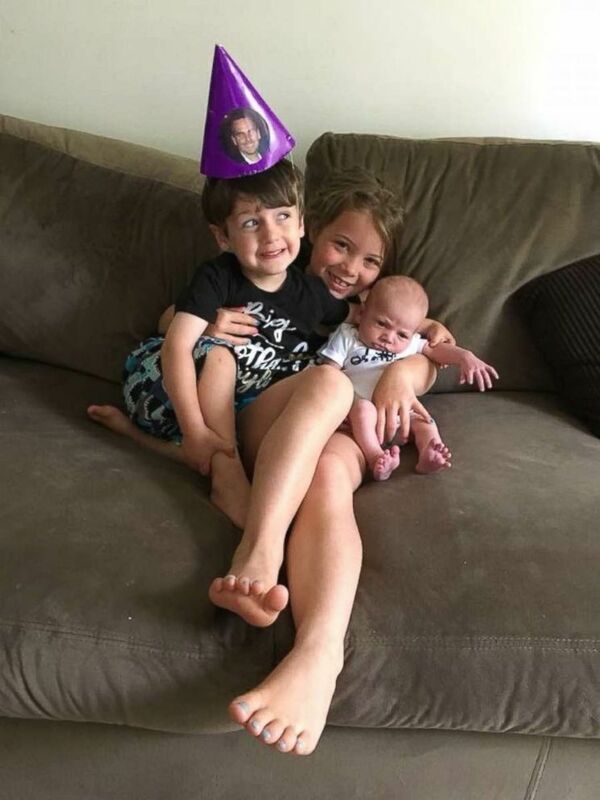 (Courtesy Kathy Sherlock) Kayden Mancuso is seen here with two younger half-brothers in this family photo. But Mancuso's sister said her brother hated seeing his daughter so happy in a new family. "His hate for Kayden moving forward, getting so excited about the new house and the puppy and her new room, he was spiraling out of control," Allyson Mancuso said. Two years ago, Kathy said Mancuso made a surprising move and asked her for partial custody of Kayden. "He wanted custody because he thought, in his head, that more custody get the less money you have to pay," she said. Jeffrey Mancuso represented himself in court at the custody hearing in front of Judge Jeffrey Trauger and, Kathy Sherlock said, "it was a circus." "Jeff is attacking Kathy with all of these accusations and it wasn't like, it wasn't procedure," Brian Sherlock said. And the judge, they said, allowed it. The Sherlocks said Jeffrey Mancuso also lashed out at Kathy outside of court, calling the police on her over and over again. "He called the police station 30, 40 times demanding that they go to my house and get Kayden," she said. "The police actually had to go back to him and say, "If you continue to harass us you're going to be filed for charges,' because he wouldn't leave them alone." The Sherlocks said Jeffrey Mancuso had also grown violent towards his mother, and physically assaulted her in front of Kayden at one point. That was when, Allyson Mancuso said, Kayden admitted for the first time that she was afraid of her father. "I think the incident with my mom did scare her," Allyson Mancuso said. "We did ask her [Kayden] after that incident, 'Did you think Daddy was going to hurt you?' And she said, 'yes.'" 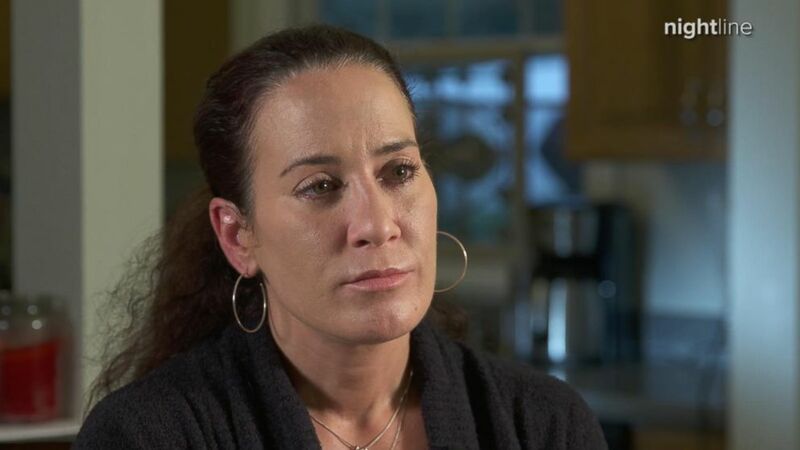 A little over a year into the custody battle, Kayden’s mother, now desperate to keep her child safe, filed for a restraining order against Mancuso, but she said her complaints fell on deaf ears. "I tried everything," Kathy Sherlock said. "The police were like, 'well he's not hurting you.' They were all about abuse and neglect. If I couldn't prove that he was abusing me, which ... sure I ... I had records from months before but, 'no one's going to listen to you… why didn’t you do anything then?'" Kathy says her lawyer didn’t seek a long-term order for Kayden. She said she gathered witnesses, including her principal, a teacher and Kayden’s soccer coach, who saw a confrontation between Mancuso and Brian at one of Kayden’s soccer games after Mancuso arrived with the little girl at the end of the game. "She [Kayden] is crying because she knows that she's late," Brian Sherlock said. "The coach puts her in, literally in the game for two minutes, the whistle blows. So the games over, seasons over. She starts crying hysterically and she runs to me... he, he, he just gets right in my face, just like, 'you got a problem with me? You got a problem with me?'" Brian said it looked like Mancuso had been in a bar fight recently. "His whole face was banged up. He had blood and scrapes all over his knuckles and hands," he said. Kayden’s coach Chad Smith witnessed the encounter and told ABC News that "it looked like he [Jeffrey] was trying to provoke him [Brian] into a fight." Kathy Sherlock said she brought all of this into the custody battle, including testimony from Kayden’s principal and teacher who witnessed the confrontation at the soccer field. All confirmed Jeffrey’s disturbing behavior, which was described in the judge’s order as being "rude, belittling, abusive and condescending." "He never had any character witnesses testify on his behalf," Allyson Mancuso said of her brother. "Not one person in his family could go in front of a judge and swear on the Bible and say, 'He's a great father. He would never hurt his child.'" In the face of mounting evidence against Mancuso and calls for intervention, Kathy Sherlock said Judge Jeffrey Trauger still wasn’t taking her seriously. She said the judge thought, given Mancuso’s statements, that she was "a crazy mom." "He ordered me a mental health evaluation and … he's like, 'I think you both need help,' like, 'I think you both need therapy,'" Kathy Sherlock said. In the court-ordered psychiatric evaluation, Kathy was seemed to have anxiety, but Jeffrey Mancuso was diagnosed with "major depressive disorder, moderate with anxious disorder," and identified with "narcissistic and antisocial personality traits." "They also said he had no remorse and took no responsibility for any of his actions, which that's scary because that means you're capable of anything," Kathy Sherlock said. A custody evaluator recommended to the judge that Jeffrey Mancuso’s visitation should be unsupervised only if he received mental health treatment. But while the judge advised Mancuso to get help, he awarded him unsupervised visits with no mandatory mental health treatment. "There were times where I just said my biggest mistake was I should've just gone into contempt or jail or whatever they do to moms that don't let their kids [go] ... but she was dragged out of my house by the police one time. So there was nothing I could really do," Kathy Sherlock said. "He [Jeffrey] was standing in front of my house, shaking his court order, saying it's my custody and the police came in and said, 'We have to follow the judge’s orders.'" On Aug. 4, Kathy and Brian Sherlock dropped Kayden off at her dad's house for the weekend. When Mancuso and Kayden didn’t show up that Sunday night, the Sherlocks called police. 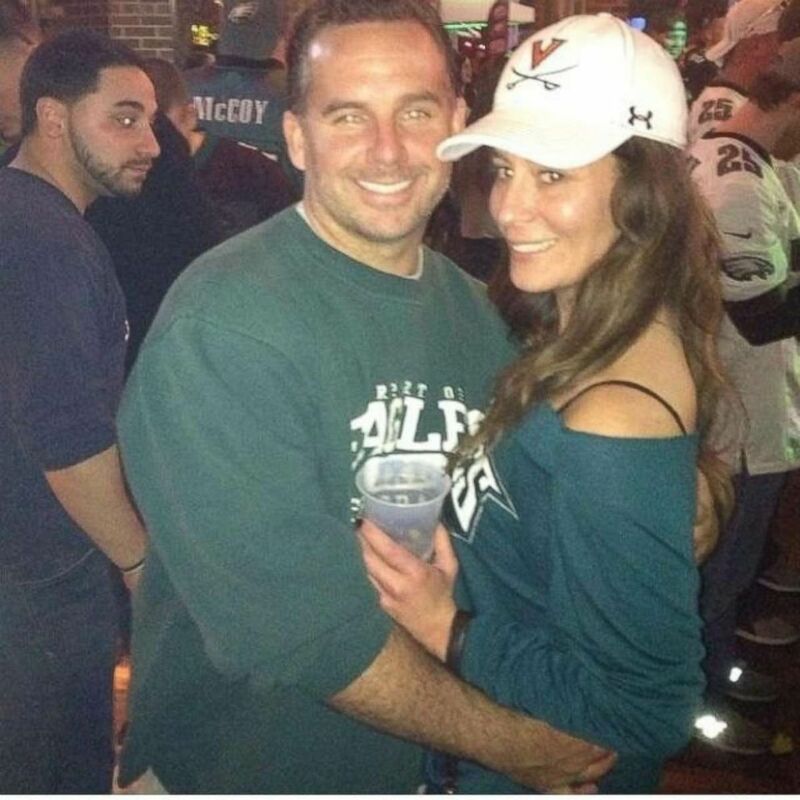 The Philadelphia police said they could not comment at this time as the matter was under internal review. Eventually, Brian decided to go over to Mancuso’s home where Kayden was staying and got inside through an unlocked back door. That’s when he discovered the worst. "I got to where the steps … I turned left. And she was just lying there," Kayden's stepdad said, crying. "And I knew she was dead. I knew she was dead." He called 911 and authorities arrived promptly to the devastating scene. "They came in three minutes. Everybody showed up. But it was too late," Brian Sherlock said. 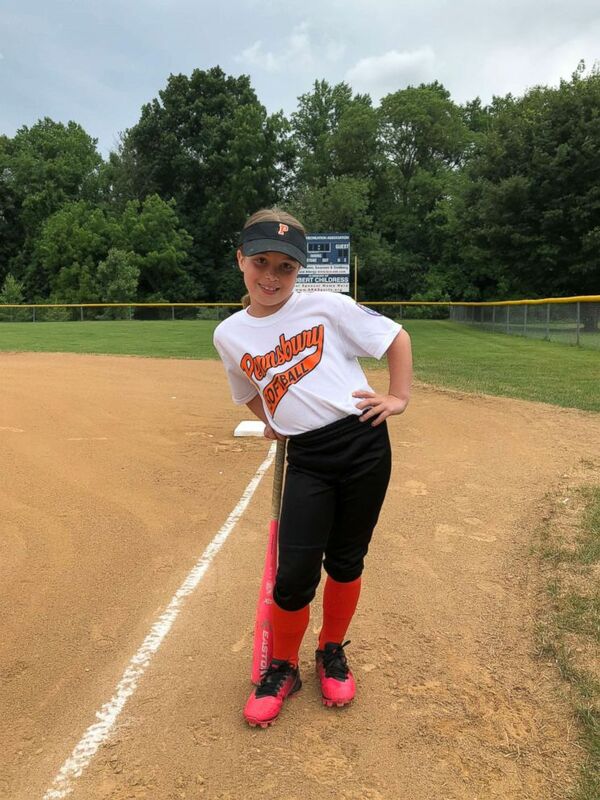 (Courtesy Kathy Sherlook) Kayden Mancuso is seen here in her softball uniform. Jeffrey Mancuso was also found dead in what police later determined to be a murder-suicide case. Allyson Mancuso, who tried for years to protect her brother, couldn’t protect the niece she so adored. "I hate him. I'll never forgive him. And I wish he'd rot in hell for what he did," she said. "The action that he carried it out, thinking about his hatred, and that couldn't overcome. He just didn't have the ability to really love. I just don't think that mentally ill people have the ability to love," his sister added. The 7-year-old's death rocked the Philadelphia community, with family and friends asking why the judge allowed Mancuso unsupervised visits, despite his criminal past and mental instability. "He should have put visits supervised," his sister said. "Even if they were with another family member until he could be truly evaluated, helped, put on medicine, committed, whatever needed to be done." In a statement to "Nightline," Judge Trauger's office said court records do not support the Sherlocks' comments about the judicial proceedings or presiding judge, adding that he strongly encouraged both parents to seek mental help, not just for their own personal benefits but for Kayden's as well. Philadelphia Inquirer reporter Julie Shaw covered the story of Kayden’s death for the paper and said after her story ran, she "got calls from other mothers in this region saying that they've also experienced something similar where they say judges give the father (un)supervised visits because they are trying to be equal." An online petition calling for the removal of Judge Trauger quickly gained popularity, with over 40,000 signatures. Yet, Frank Cervone, the executive director of Support Center for Child Advocates, said family court is fraught with contentious claims and judges are confined by the law. "It’s not uncommon for parents with a violent criminal background to be awarded unsupervised visits as long as they don't show that behavior to a child," Cervone said. "When you think of the numbers of persons in this country who have criminal records including for violent behavior we would have lots more kids in foster care and lots more kids not seeing their parents." Despite what the law says a judge can do, Kayden's family said that failing to heed the warning signs they presented to protect Kayden is what ultimately failed to protect her from her unhinged father. The system, the Sherlocks' said, needs to put children’s safety first. The family is planning to meet Friday with Pennsylvania Gov. Tom Wolf’s office to push forward "Kayden's Law." "You protected his rights versus hers," Kathy Sherlock said. "Essentially, his right to be a parent was more so important than her right to, essentially, live." "I miss talking to her," she continued. "I miss holding her hand and I miss kissing her in the morning and good night. I miss her little voice. I miss every single little thing about her. And the fact that I'm never gonna see her again ... I hate it." Her hope, Kathy said, is that Kayden’s death will be able to make an impact to help other children in the future. "I don't have a choice," she said. "I did not want to spend the rest of my life doing something like this. Who would? But, it's the way it's gonna be."